At the age of 28, Sankichi Toge suffered the atomic bombing at home in Midori-machi, three kilometers from the hypocenter. After the war, he participated in youth and cultural movements and gradually became a leader in the peace movement. He published a number of books opposing the atomic bombing and advocating peace. The start of the Korean War intensified pressure from the occupation army against the anti-atomic-bomb movement. Toge protested President Truman's statement that he would not rule out the use of nuclear weapons in the war. While hospitalized with tuberculosis at the National Hiroshima Sanatorium, he published the book A-bomb Poetry. When it was sent to the 1951 World Youth Peace Festival in Berlin as one of Japan's representative works, A-bomb Poetry gained international acclaim. On March 10, 1953, Toge died at the National Hiroshima Sanatorium at the age of 36. 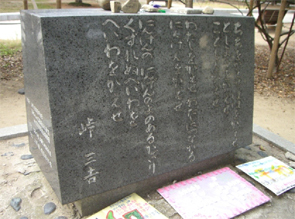 This Toge poem is engraved on the monument.